Virtual reality allows scientists to gain insight into protein structures from the inside out. To understand a protein, it helps to get inside of it, and a biochemistry professor has figured out a way to do so. 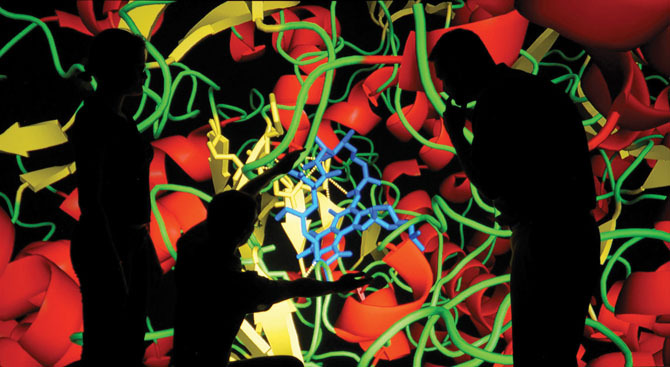 James F. Hinton, University Professor of chemistry and biochemistry, worked with Virtalis, an advanced visualization company, to create a computer software program and projection system that lets researchers look at larger-than-life, 3-D structures of proteins in virtual reality. This allows scientists to walk inside, through or around a protein to investigate its structure and function. “Proteins are very complex molecular structures,” said Hinton. Proteins are built from amino acids, molecules that share certain characteristics and have unique side chains. Yeast proteins can have 466 amino acids, while the larger proteins have almost 27,000 amino acids. These amino acids interact to form a structure for each protein, and this structure helps determine the protein’s function. Since proteins underlie most human diseases, they interest researchers studying the mechanisms of disease. The flu virus, for instance, harbors proteins that cause the illness experienced by humans. Figuring out how to neutralize these proteins could help treat or prevent disease. Examining protein interactions in two dimensions ranges from tedious to impossible because of the proteins’ size and complexity. This system allows researchers to enlarge proteins to room-size and examine them from all sides, including the inside.